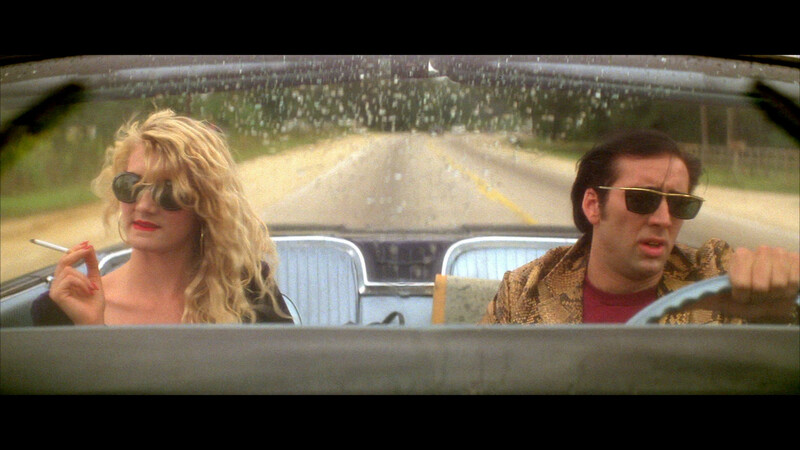 David Lynch’s Wild at Heart is the slowest, cruelest kind of train wreck. It runs off the rails and plunges through a carnival freak show, throwing up bits of colorful fabric, garish lights and the viscera of the lamentably and comically deformed, before grinding to a stuttering halt in a near-by ravine, saturated with the stench of human offal and the screams of the dying. Calling the film excessive, or indulgent, is a grotesque understatement. This is, without a doubt, Lynch at his most tonally schizophrenic, as even Inland Empire kept up a mostly persistent mood of dread throughout its enigmatic overkill (random dance numbers aside). Thoroughly obscene and laughably revolting, the film constantly whips through a gamut of tones, from forced romantic tripe, to hokey, anorexic noir, to Dadaist nausea. Then it has the balls to go back and do it again, and again. All the while, it’s punctuated with bizarre non-sequiturs that give the audience nothing, but maybe the occasional aching jaw, or bleeding scalp. This isn’t just a train wreck, it’s vomit that coalesced into a train wreck! It is a savage, unpleasant, and overdone torrent of acidic, steel nastiness, and I wouldn’t be surprised if it stripped the enamel off Mr. Lynch’s teeth on the way out, and left nothing but scorched nerves.